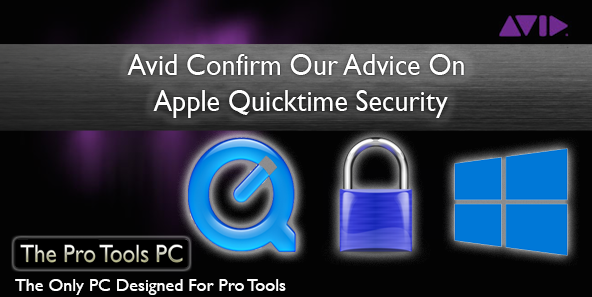 10 days ago I wrote an article here on The Pro Tools PC Newsbog with detailed advice on how to best protect yourself from the Trend Micro report on some identified security flaws in Apple's Quicktime on the Windows OS's (You can read the full story here). Avid have now come forward and verified the advice I had given in their own support document just published to the Avid website (which you can read here), they also say a long term fix involving lifting the dependency of Quicktime entirely is in the works and will be released later in the year. It's nice to see Avid verify the advice we had previously given which should hopefully be some comfort to anyone still unsure of the safest route to take, I'm certainly looking forward to that update later in the year, thanks Avid! Has everything been running OK for you so far? Be sure to leave us a comment of your thoughts below, share the story with your friends and if you want more of this kind of content delivered straight to your email inbox sign up for our mailing list right here. Posted in Discussion, Education, Free Support, News, System Maintenance, Tech Support, Technical Article and tagged Apple, Avid, Pro Tools, Quicktime, support.